Peter Miller and Carla Langhorst are multi-business owners and strategic advisers who are passionate about helping people understand and excel in the world of social enterprise and social impact. Langhorst founded a social enterprise that employed marginalized groups and later created an e-learning platform that supports over 100,000 business owners. Miller launched six different businesses, has helped more than 720 startups and 20 social enterprises get off the ground, and currently teaches university classes on social enterprise and marketing for good. 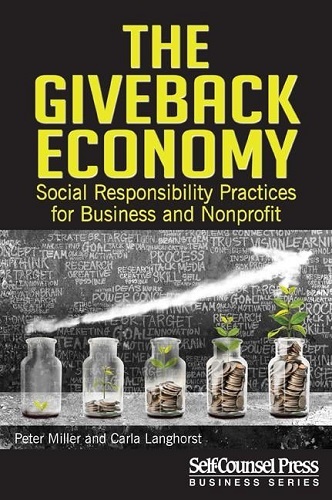 The two recently co-authored a new guidebook, The GiveBack Economy: Social Responsibility Practices for Business and Nonprofit to help readers navigate their social entrepreneurial journey. SEE Change spoke with them to discuss their book, decode the “buzzwords” and shed light on the biggest challenges faced by social entrepreneurs and how they can leverage social impact to benefit community and business. How would you define the “GiveBack Economy” and how/why is it emerging in importance? (PM) The GiveBack Economy is the new economy where individuals, businesses, nonprofits, charities and academia are spending more time, money, effort and passion in giving back to their communities, resulting in great outcomes and benefits. Social innovators, social enterprises and businesses with corporate social responsibility contribute to making change for good. Recent studies have shown that more than 90 percent of business owners want to find ways to give back to their communities and more than 60 percent of consumers prefer to do business with socially responsible companies. Millennials want to work for such companies and will spend more on products and services. (CL) Classic! This is why writing the book was so interesting, as Peter and I struggled with important questions throughout. And of course, I will humbly disagree that the GiveBack Economy is not necessarily new, but it has been there all along. It is emerging in importance as the other structures that have held it in place are no longer working the way that they used to. The government is struggling to continue to fully meet the funding needs of social service agencies and other institutions such as the faith organizations and United Way are experiencing a decline in givings. This is creating a perfect storm where the GiveBack Economy is figuring out how to fill this gap in the long run. What are the challenges facing social enterprises and companies looking to make a difference? (CL) Interestingly enough, the hardest part for social enterprises is really understanding the problems that they are addressing and making sure that their idea is really the right fit. It’s exciting to think about starting up an organization that is going to help people, but to be able to listen to people who are being affected by the problem and really design it with them is the sign of a great social entrepreneur. (PM) And then, once up and running, the two main challenges for them are building their team and financing the early stages of their startup. Never easy. (PM) For companies, there is often a research and education process that takes place. Management needs to have information to show them what types of organizations they should consider supporting. (CL) And that is [just] the beginning, as management will always need to be reassured that their choice was the right one. Measuring the social impact from the company’s involvement and communicating that becomes vital. What are some strategic ways they can tackle those challenges? (PM) To get help from volunteer advisory boards is great! You can gain free advice, referrals and trust. There are a lot of organizations out there to help, like volunteer centres. Keeping volunteer tasks as bite-sized pieces of four hours and highlighting the benefits of volunteering will help you stand out. Financing requires thinking outside of the box and understanding the huge range of revenue streams that are available to social enterprises and social entrepreneurs. There are actually more available than what a traditional business has – but you’ll have to read the book for that! (CL) As for understanding the problems deeply, that’s easy. You have to immerse yourself and be as humble as possible. The GiveBack Economy is all about creating things together and hearing each other’s stories. It is being real. Which is probably why it is so rewarding for people who are already actively part of it! ‎Any other advice you’d give to those looking to start social enterprises? (PM)First start with passion. Without that, don’t even bother. (CL) Agreed! (PM) Then understand the problem. That’s huge just like Carla already talked about. Then brainstorm the possible solutions. There is probably more than one that you can choose from. There are probably lots of good things that are already happening that you could partner with or join. So, spend some time on this to choose the best way to move forward. (CL)That’s right. There are lots of times where people want to start their own thing. But that isn’t always necessary, or helpful. If you focus on the problem, maybe partnering or helping to grow something that is already doing great things is the best way to go. That’s what’s so great about the GiveBack Economy; there is a great willingness to collaborate. (PM)Then the last step – prove it. Validate that the solution meets the needs of those impacted by the problem. And prove that someone will pay to make this happen. (CL)This doesn’t always have to be the client who pays. There could be sponsorships or cross-subsidies or lots of other revenue streams. But the numbers have to add up to make this work. How do you foresee the economy of the future and its impact on our lives? (CL)This is just the tip of the iceberg. The GiveBack Economy has been around but it is finally entering the mainstream. It is having an effect in all areas. Educational institutions are teaching millennials about social entrepreneurship; at the government level there are social enterprise strategies that have emerged and have gained traction; we are seeing this in nonprofits where they are exploring how this is going to help with their financial sustainability. Some have over 50 percent of their income coming from a fee-for-service model, and we are seeing a surge in people wanting to join the GiveBack Economy both personally and professionally. What does this mean? I think it is hopeful. There is a lot of negativity that we hear about in the world today, but there is also this hopeful thing that is emerging. I’m hopeful that the GiveBack Economy will keep growing to such a size that it starts to change the negative narrative to what is possible. (PM) For us, we wanted to be part of this growth. The royalty proceeds [from the book] go to the GiveBack Fund which is housed under the United Church of Canada Foundation to support the creation of Community Innovation Hubs in spiritual institutions such as mosques, synagogues, temples, parishes and churches. An example is the Markham Community Innovation Hub where we have 18 hubsters who are small business, non profits and charities who learn to grow and give back, and the church engages with and gives back to community. (CL)We think that if you write a book like this, you need to walk the talk. And this is one way that we are immersing ourselves into the GiveBack Economy.